For those of you who read the earlier Introduction to HF, you’ll remember that I described the various properties of the HF bands, what you can expect from them and when propagation to certain Countries is possible. Now I’m going to put some of those theories into practice. Whether you’re “rag-chewing” – long overs about mundane topics like gardening, car restoration or the price of fish, contesting or chasing far-away stations on exotic islands – There’s something for everyone on the bands. I often joke on Twitter that a 5 and 9 QSO is as much relevant as a 30-minute waffle – This is mostly in response to people who complain about “another HF contest”. In truth, contests CAN get in the way of “normal” QSOs and even certain mode sections of the band: CW contests can often creep into the digimode portions of the band and the same applies during a PSK contest: The JT65+JT9 frequencies (particularly on 14MHz+21MHz) get completely wiped-out. The 3 WARC Bands can help here (10MHz, 18MHz, 24.9MHz) but, in general, there is usually a good QSO to be had somewhere if you know how the bands work. Can I DX with low power and a bit of “wet-string”? Yes, you can be a DX’er with even a basic set-up – No big tower, no big yagi and certainly no big power output. At my QTH, I run a fan-dipole which works on 7MHz, 14MHz, 21MHz and 28MHz plus I have a 1/4wave vertical for 7MHz+10MHz. I use a Yaesu FT-950 with a maximum of 100w (on SSB) and generally 50w on CW and 35w PSK. If I’m using one of the JT modes, I’ll often run 5w-10w. Interestingly, my “Best DXs” on several bands are thanks to the JT65 mode using 15w: 80m Russia EU, 15m Australia and 10m Argentina. My all-time best QRP record is P49X (Aruba) on 15m RTTY running just 1w from my FT-817 at a distance of 7580km. If you’ve listened on the HF bands and heard a station say “listening 5 up” then that’s know as “Split Operating”. A similar concept is used on 2m+70cm repeaters: You transmit on 1 frequency, but receive on another. On HF, this practice is usually reserved for DX’peditions but can be used by Special-Event stations as well. The idea behind listening on another frequency is that the station can pick out a callsign and then give them a signal report on their clear “transmit” frequency. This allows for a more efficient series of QSOs because it doesn’t rely on the single (simplex) frequency being clear before both stations can hear each other.. The trick before attempting to contact a DX station is to listen – First you need to know who they are, so listen for their Callsign. One of the most irritating occurrences is the operator who brings a pile-up to a crashing halt by asking them for their Callsign! It wouldn’t be so bad had they not spent ages calling and calling them – Why call somebody you don’t know? So, once you’ve established who it is and whether you are interested in them you’ll need to listen to the QSOs taking place: Are they just giving a signal-report? Are they working split? Are they listening only for a particular Continent? You may be pleased to make a QSO over to the continent on 7MHz or 14MHz, but the USA or Australia can be just as workable if you know where and when to find them. Typically, the path down to Australia (VK) and New Zealand (ZL) is good on 14MHz at our sunrise. There is also good propagation on 7MHz during their sunrise. 21MHz (15m) is a good DX band if you want to work the USA and Japan – there’s usually some activity from JA land just after breakfast and then, around lunchtime, you’ll hear the USA at their sunrise. Generally, the higher bands 18-28MHz offer reliable daytime propagation but during our night-time they are typically “closed”. 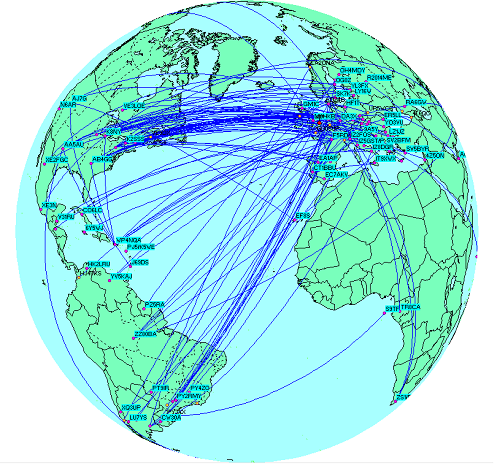 Daytime contacts around the UK, over to Ireland and France, Germany and the Netherlands are possible on 40m with more distant contacts available after-dark. This makes 40m quite an interesting band because during the day it’s full of fairly local (UK-based and close-Continental) stations but after dark you’ll hear very little “inter-G” but lots of Eastern Europe and – if you’re lucky – stations from even further away. For a more detailed look at the bands, please refer back to Part 1: The HF Bands of my earlier “Introduction to HF” article. Also worth a read is this: Ham Bands article on Ham Universe. So, how else do we find this elusive DX on the bands – Unless you’re fond of casually tuning around (which is also adds to the satisfaction when making the contact), a little bit of help from our friends is required… There’s a variety of software applications available to assist you with finding DX as well as letting you know how the bands are performing. A DX Cluster or “the cluster” is a term you may have heard before – It’s a server that collects and distributes DX Spots to other Clusters and connected Users. The idea is that somebody hears (or works) a far-away station so they post the Callsign, Frequency (and perhaps a comment) to the DX Cluster which, in turn, sends that information out to whoever is connected. Essentially, it’s a public bulletin board and allows you to see who is working who. Some people see them as a help: Perhaps for keeping an eye on propagation – Others see them as a nuisance: A spotted station is invariably swamped by stations calling ensuring chaos on the bands! If you use Ham Radio Deluxe then you’ll have a DX Cluster window on the Logbook screen. You’ll also have a live Band Scale that shows a vertical frequency scale and plots the Callsigns so you can see who might be on the frequency that you’re tuning on. You may have heard of PSKReporter and the Reverse Beacon Network – these offer real-time spots of stations being heard/worked. These websites rely on stations around the World running what is known as a Skimmer which is typically connected to an SDR radio that can cover multiple bands at the same time – The software then decodes the CW (or Digimode) signals and posts them to the PSKReporter and/or the RBN websites. These “spots” can be plotted on a map allowing you to see the RF paths being worked. Below is a screenshot from DX Atlas showing 10m activity on a particularly busy afternoon. DX Atlas takes the DX Cluster information and displays it in real-time on a rotating/zoom’able map. You can easily see at a glance which band has propagation to a particular part of the world. Here’s what the DX Cluster looks like in PZTLog which has been set to show 14MHz, 21MHz and 28MHz DX spots – CW is yellow, SSB is purple and green is Data. There is also a “Country” column just in case you’re not certain of where a particular callsign is from! There are no specific calling frequencies on HF so you can pick a section of the band, check if the frequency is clear and then start calling “CQ”. It is entirely up to you what kind of QSO to have when somebody answers you – Typically, you’ll exchange a signal-report, your name, location and perhaps your radio+aerial equipment. Luckily, almost every operator will speak basic English so QSOs with many different countries will be quite straightforward but try to keep your conversation style “basic” eg: bullet-point form. 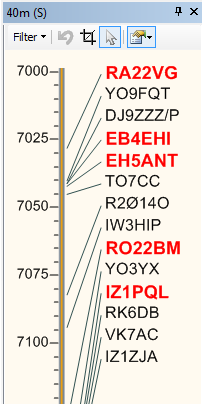 The use of Q-Codes can be helpful, especially if signals are fluctuating up/down. If you’re feeling adventurous, you may wish to learn a few basic greetings in Dutch, French, German, Russian, Spanish etc. Even just being able to say “thank you, good bye” in their language is a nice gesture. Before you reply to a station calling CQ – have a listen to the kind of information they are giving. It may just be a signal-report and their name – they may have a longer over and describe their station or local weather. Some operators like to work lots of stations, so the QSO is quick and snappy whilst others prefer to have a chat and perhaps improve their English. The weekends often feature a contest (or 2) and these can be a great way to increase your DX count or simply practice your operating technique. This Contest Calendar (courtesy of WA7BNM) is the one I use to see what contests are taking place. They will vary from CW (Morse code), to SSB and even PSK+RTTY digimodes. These take place on the 80m, 40m, 20m, 15m and 10m bands with 30m, 17m and 12m (the WARC bands) being contest-free. Some contests operate using a signal-report and incrementing QSO number (aka: serial-number) starting at 001. So you’d give your 1st contact: 59 001, then 2nd would be 59 002 and so on. Other contests, like CQ Worldwide SSB exchange a signal-report and CQ-Zone – our part of Europe is 14. Signal-reports are almost-always 59 on SSB and 599 on CW/Digimodes – It seems that speed is the key in these contests rather than an accurate signal-report! That’s it, short, snappy and no other pleasantries. Despite the often crowded bands during a contest, there’s no reason why you can’t use them to your advantage – The stations will generally want to work you as much as you want to work them, so don’t be shy. In many ways, there’s no perfect way to operate except to say that you need to be patient, polite and apply a little common-sense. Software like Ham Radio Deluxe, DX Keeper, PZTLog and others provide logging of QSOs along with detailed Stats on your DXCC/Country count and which Bands/Modes you have worked – If you wish to get confirmations of contacts, you will need to either join the RSGB (currently £51/year) or subscribe to the QSL Receive Service (currently £11.99/year) – this allows you to receive paper QSL cards “via the Buro”. For online QSLs, there is eQSL which is free for basic use but a donation will give you extra features, and ARRL’s LoTW (Log of the World) is a popular way of exchanging confirmations. In future articles, I’ll be looking at Aerials in a series entitled Aerial of the Week – Part 1 will focus on the Dipole/Doublet. Charlie, thank you for you article. Very well written. This is what I have been looking for receanyly as I started playing with HF a bit and understanding it is a key to success. So thank you for your time making it easer for me. Thank you very much for this post . It will inspires me to improve my communication and DX practice on HF.